It has been a longer growing season and I am tempted to make another batch of dill pickles. Here is a recipe for brine I have used for many many years. 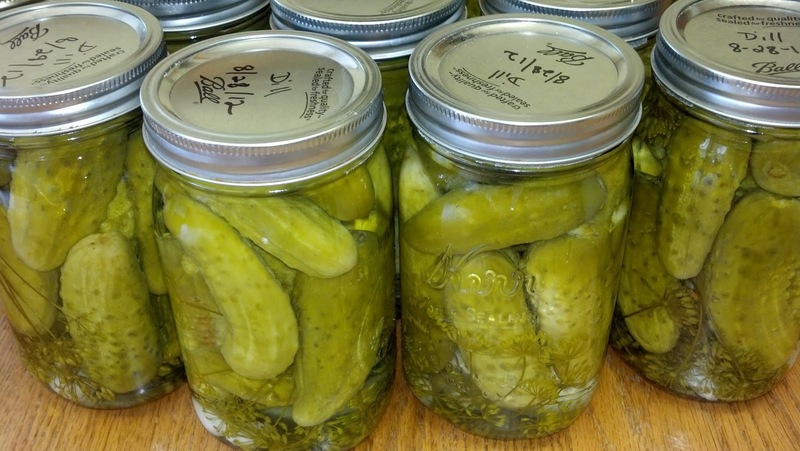 It is simple so be prepared, making pickles is so much easier than many have thought and so much better than the jars on the shelves at the grocers. 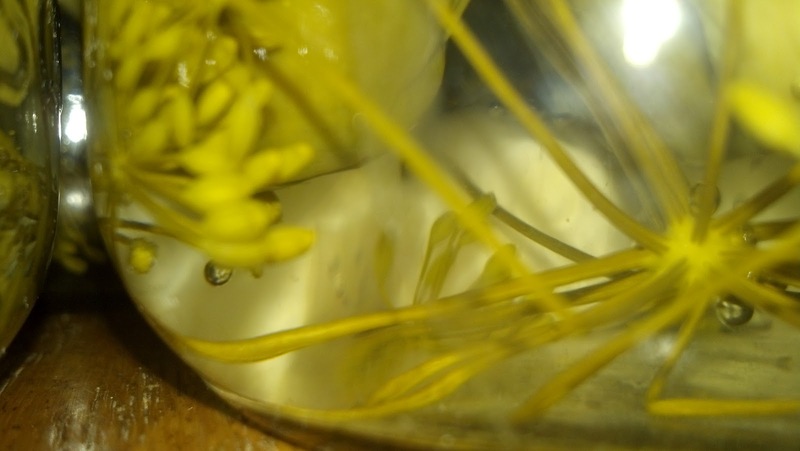 Place sprig of dill in each jar along with a clove or two of garlic. Add cucumbers, a bit more dill and another clove of garlic, packing the jars full. 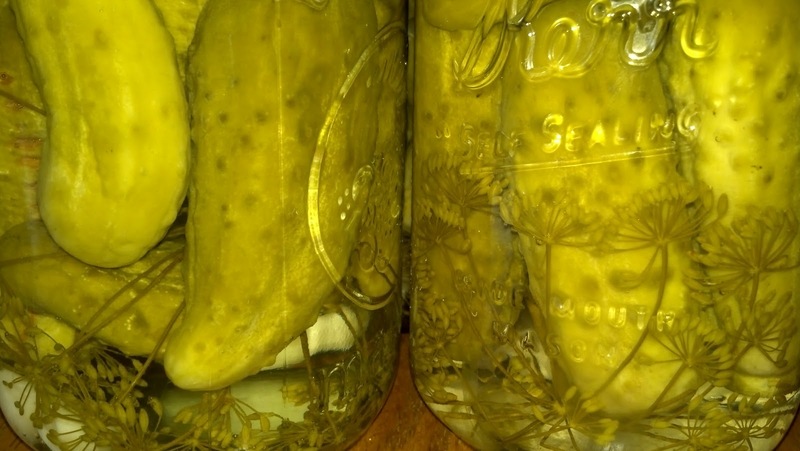 Run knife along inside edge of jars to remove any bubbles that may be in the brine. Wipe edges with clean cloth. Process in hot water bath for 15 minutes. Remove jars to a table covered with folded towels. It will be a joy when you hear that first 'ping' or two, telling you your jars have sealed. * If you have never canned before, please check with your local county extension office for the latest instructions for canning and preserving fruits and vegetables. Also check out Ball's website to learn this traditional home art. I have been making pickles for more than 30 years. It is a lot of work at times but it is fun work that makes you feel like you've accomplished something when you stand back and look at the lovely rows of colorful jars on the pantry shelf. Friends and family clamor for a jar to take home and it is satisfying to share the fruits of this labor. My daughter Erin helped me make this batch. She could have made them by herself in the time it took me to prepare the multitude of garlic cloves needed to make these Kosher Dills. I could not keep up with her swift hand at the sink scrubbing cukes and filling jars. The camaraderie in the kitchen is one of the best parts of the project. Time spent well with team work and bits of conversation as the process unfolds. "Did we make a double batch of brine?" "How many cloves of garlic per jar?" "What time is soccer practice again?" Setting the timer for processing and setting to the next batch jars and lids keeps things moving. Garlic and Dill add complexity to these treats. We traditionally open the first jar for Thanksgiving dinner. I think I am counting down the dates already!